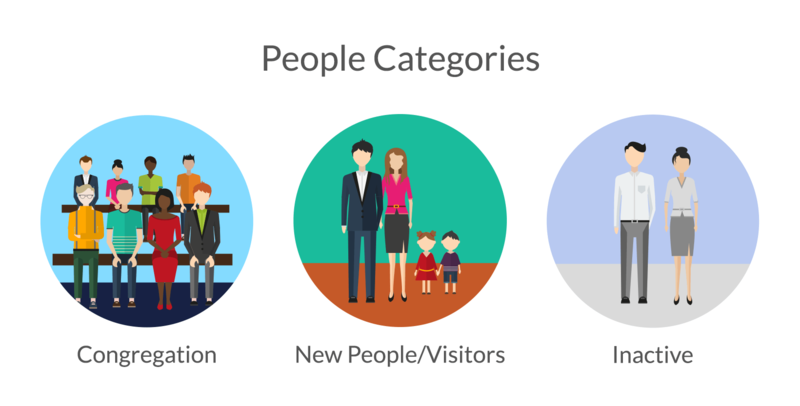 People categories provide a powerful way to handle the different types of people in your church. A person can only be in one people category at a time. When setting up people categories for your church, think about the different ways you like to class active members or contacts. What kind of categories would be helpful for you to sort by and report on as a church? Tithe.ly ChMS’ default categories are Congregation, Visitor/New People and Community Contacts, but you can change these or create other and more specific categories to distinguish between members. Another great feature about people categories is that you can create category-specific custom fields, and design the layout of information for people’s profiles within them. All of your people have default fields like first name, last name and email address, but any additional fields for your people are called ‘custom fields’. There’s no limit to how many custom fields you add, and the fields can be used to store additional contact information or relevant data, such as allergies, blue card expiry date, interests, or answers to a survey. This is useful for things like reporting and generating specific People Views. What are People Categories for? Categories, unlike a person’s status, are not directly related to pricing. This is where a church has the opportunity to group and sort people in their own words. A person can only be in one category, and only has one status.